Whether they’re in Beijing, Warsaw, or San Francisco, every student in Harvard’s HBX Live! virtual classroom now sits front and center. (Poets&Quants) — The day’s Harvard Business School case study poses a simple question: Is Uber really worth $50 billion? 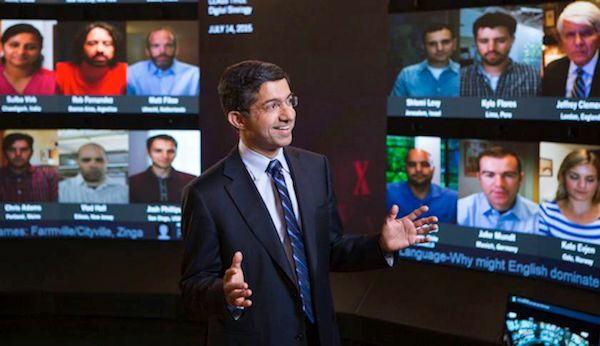 Anand, meantime, faces the images of 60 students portrayed on a curved screen in front of him, a high-resolution video wall composed of more than 6.2 million pixels that mimics the amphitheater-style seating of a class HBS tiered classroom. Because each image is two feet wide and two-and-one-half feet long, there is no sky deck, or top back row in the class. Essentially everyone sits front and center, whether they reside in Beijing, Warsaw, Prague, Miami, San Francisco, or Toronto. The genesis of the virtual classroom can be traced back three years ago when HBS began to think seriously about its online presence. The school rejected the notion of doing free MOOC courses, a path most notably chosen by the Wharton School. Instead, the school built a proprietary platform that emulated the case study method of teaching and first offered a program of business fundamentals to current and recent undergraduate students in the liberal arts. Quickly, the team ran into major technical challenges. Many of the desired features in a virtual classroom were not readily available, from high quality digital blackboards to the ability to hook up 60 students on a single video screen from locations all over the world. Ultimately, HBS went to numerous vendors and with the assistance of McCann Systems, a New Jersey-based audiovisual systems integrator, it tapped into technology from such companies as Cisco for video, BSS for audio and X20 for the software platform to cobble together what it needed. It took three iterations alone to get the digital chalkboard to work without either delayed response times or annoying glare. The school also made the decision not to build the virtual classroom on campus, in part to lower its investment costs but also to gain the know-how of TV production professionals. No existing classrooms on campus have the 26-foot-ceiling height of a studio to handle a sophisticated lighting grid or the 15-foot-high by 27-foot-wide dimensions of a curved video wall. The school also lacked uninterrupted power supply. “If we did this on campus and the power went out, we wouldn’t be able to have a class,” says Kierstead. So the school agreed to lease an existing studio space at nearby WGBH, the public broadcaster, along with a control room. After the mock Uber case class is over, Anand asks the students in the class what’s different about the experience. Several click on a button on their laptop screens, causing their nameplates to turn red and signaling that they have raised their hands to speak. Others immediately respond via chat bar, and their comments along with their pictures and names, tumble onto the bottom of the vast video screen, moving along like the news ticker in Times Square. “I feel more visible,” says Kristen Maynard, who says it’s not possible to hide in the back row of a class. The downside? When you’re only in front of a computer, you can’t really look around the class and observe your classmates. “We don’t get to see the body language,” says one. “The headset was uncomfortable,” adds another in his chat bar. Harvard Business School expects to host more than 100 classes and events in the studio this fiscal year, including a research seminar for faculty and sessions for MBA students when they are abroad on their global immersion trips. Strategy guru Jan Rivkin plans to hold a seminar with civic leaders all over the country as part of the school’s U.S. competitiveness project. Harvard is already offering corporate clients live access to disruption guru Clay Christensen, who already has done an online course on the HBX platform. And the executive education group plans to use the studio to connect with students in between the two on-campus sessions of the school’s general management program. Though HBS won’t disclose the actual cost of the classroom, Anand says that it is slightly more than a typical tiered classroom in a campus building. “We are probably in the $300 to $500 range per student per session, and that includes all fixed costs and variable costs,” he says. While only 60 students can actively participate in a class, up to 1,000 others can observe with a 15-second delay which would significantly drive down costs, he adds. Ultimately, he says, the school could have two or three of these virtual classrooms. The students laugh and so does Anand. But the point is well taken. Just how disruptive Harvard’s classroom of the future is will largely depend on the school itself. So far, HBS has put six cohorts through its CORe online program that launched in June of 2014. All told, the school is just shy of 4,500 registrants in the program from more than 70 countries, with another cohort starting Sept. 9 that is expected to have more than 900 students. With its new virtual classroom, Harvard could easily do a global executive MBA program from the classroom, an entire portfolio of executive education offerings, or even an accelerated online MBA that would not compete with its more expansive, two-year, full-time residential program. But it’s all up to Harvard Business School to decide what and when to really disrupt the high-end market for business education.